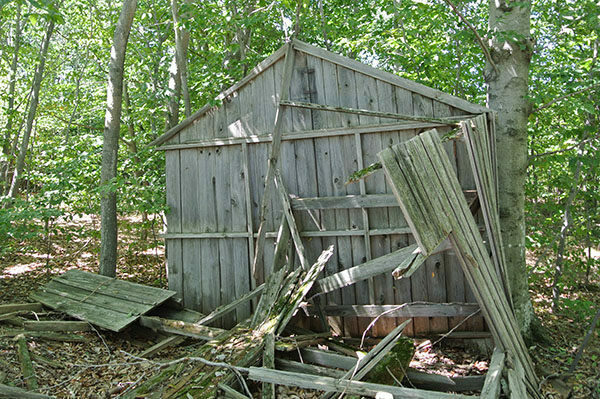 Click here to order a detailed map and a guide to North Manitou Island. 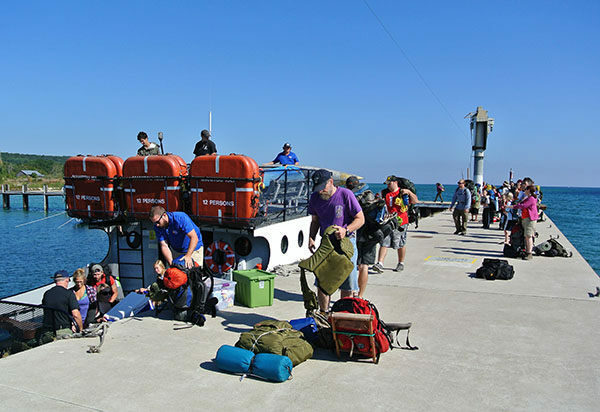 More than just transportation, the 11-mile ferry ride from Leland sets the mood for visitors arriving at the North Manitou Island. Located in Lake Michigan, North Manitou is wild, isolated, and remote, qualities that make it the premiere destination for backpackers in Michigan’s Lower Peninsula. The 14,753-acre island is 7.7 miles long, 4.2 miles wide and laced with 30 miles of designated trails and secondary trails. 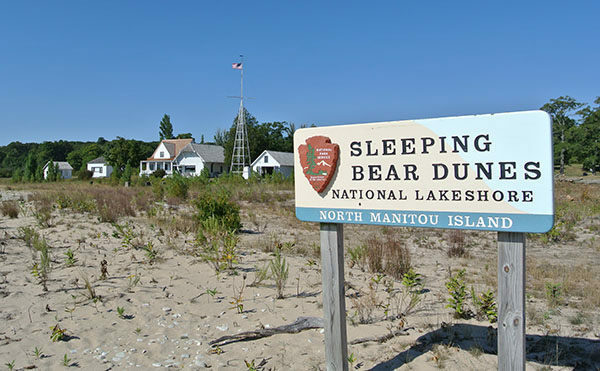 North Manitou is the most northern section of Sleeping Bear Dunes National Lakeshore and managed as a wilderness with a ban on motors, off-road vehicles, mountain bikes, and pets. No services or supplies are available on North Manitou and there are no opportunities for a day visit as there are at South Manitou Island. Visitors must be totally self-reliant, fully equipped with food, rain gear, water filters, sun protection, tents and other camping equipment needed to spend a night or more in the backcountry. North Manitou features almost 23 miles of maintained trails that are well signposted and another 7 miles of unmarked secondary trails that are not difficult to follow due to their popularity. Even more unsigned trails exist as historic trails. Other than the Village Campground, North Manitou features only wilderness camping. 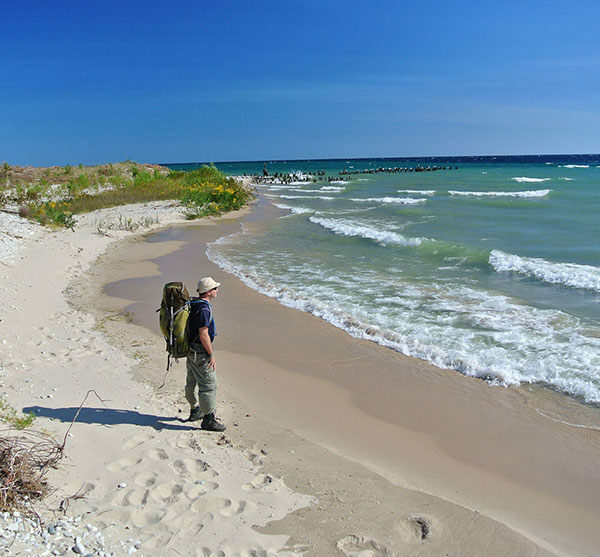 You can set up camp anywhere on the island except with 300 feet of Lake Michigan, inland lakes, streams, buildings, major trails or another camper. Pack a lightweight stove. Fires are prohibited in the backcountry. A park entrance pass is required to visit North Manitou and a backcountry permit to camp there. You can purchase passes and permits from a ranger stationed at the Manitou Island Transit office in Leland during the summer. Manitou Island Transit (231-256-9061; www.manitoutransit.com) provides ferry service to North Manitou Island from Leland from May to November. Contact the company for the current times and dates of trips as the schedule often changes from season to season. The best source of information is Philip Hart Visitor Center (231-326-5134; www.nps.gov/slbe) in Empire.